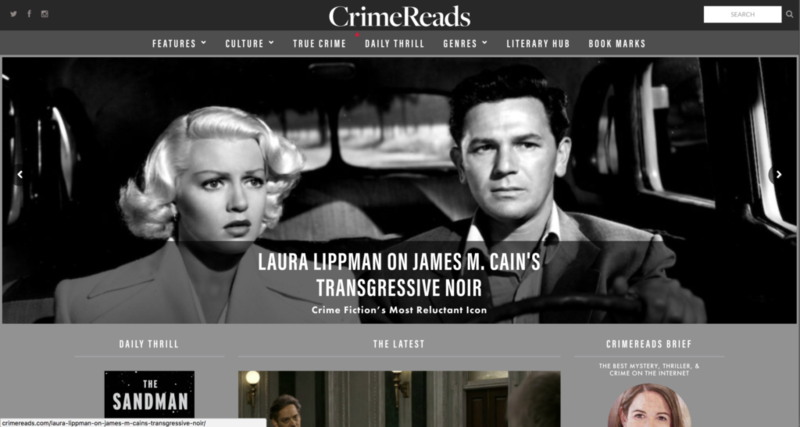 Today, Literary Hub, the Internet’s premiere site on books and literature launched a sister site, CrimeReads.com and I couldn’t be more excited about it. I mean, first of all, the project is backed by an advisory board of authors that I have the utmost respect for. People like Lee Child (Jack Reacher), Craig Johnson (Longmire), Carl Hiaasen (Florida… ahem), and Ruth Ware (In a Dark)… all authors I immensely enjoy to read. But, secondly, I had the unique honor of actually developing the new website! Does it look like Lithub? Absolutely… it’s a branch of the same theme designed to look specifically darker and more sinister… to go along with the type of content that it covers. Working from designs by Lithub’s excellent designer, Crystal Gwynn, I helped turn Lithub dark and a little more suspicious. But there was more involved than a simple theme modification. In the background, the entire infrastructure of Lithub was reworked. And the Book Marks L&F also in the sidebar of CrimeReads content. Lithub is, at it’s core, a WordPress site, that most reliable of content management systems. But it has been modified and extended so much, it’s tough to tell where Lithub ends and WordPress begins. While the content on Lithub.com is fairly standard for a WordPress install, Book Marks (the “Rotten Tomatoes” of books) is a fully custom feature developed on top of and extending the core functionality. Well, as of March 5, Book Marks is no longer just a sub-site of lithub.com, it is now it’s own site, independent of Lithub but capable of sharing content across to its parent site. And CrimeReads takes advantage of the same cross-site capability. Three different widgets were developed, each similar in look & feel but specific to each site’s design so that content can be easily shared across all three sites. Additionally, the Literary Hub home page was modified to show content specifically selected by the editors of Book Marks and CrimeReads to be featured there through custom functions designed to be easily used by the editors. Essentially, 42 Solutions took one of the largest literary sites on the internet and turned it into three deeply linked, individually branded sites in a close network… with the potential for more in the future! Working with the Lithub team, I have to say, I am blown away by their dedication and enthusiasm for books in general. As someone who dabbles in writing, it’s amazing to work with people who put my knowledge and passion for books to shame. I would be remiss if I didn’t thank Andy Hunter, the publisher, for bringing 42 Solutions onto this project in the first place. I’ve worked with him since Broadcastr and if he’s Henry II then I hope to be the William Marshal of his technology needs. But the editorial staff of Lithub is downright inspiring. From Jonny Diamond and Emily Firetog leading the way, to Dan Sheehan charging forth with Book Marks, to Dwyer Murphy as the Senior Editor and Molly Odintz as the Associate Editor of CrimeReads bringing the new site to life. As a company blog, it’s easy to take credit for the success of something and nod toward the technology solution as the reason why. But, in the case, that’s not why Lithub, Book Marks, and CrimeReads are a hit. It’s because of the people who write, gather, and publish all the content that make these sites worth reading. And that has absolutely nothing to do with 42 Solutions. We’re proud of the work we’ve done and (I think) it should be impressive to anyone looking to do the same but what makes these sites amazing is the dedication, curation, and purpose. I also think that my reading list will never, ever, get shorter since I will always know where to go for new books to pick up.